Link to webinar recording coming soon! This webinar discussed how the Americans with Disabilities Act (ADA) protects the rights of parents with disabilities. Parents and prospective parents with disabilities learned about disability rights laws and their application to the child welfare system, family law, adoption and foster care, and reproductive health care. Social workers and others who support parents with disabilities gained an understanding of the rights of parents with disabilities as well as how to ensure these families are afforded their rights. Peer supports may be particularly relevant and useful to parents with psychiatric disabilities. The purposeful disclosure of shared lived experience, combined with practical knowledge and systems expertise contribute to relationship engagement and inform ongoing conversations as peers partner with parents to meet needs and address goals. The proposed model of parent peer supports includes four core elements: engage, explore, plan, and access/advocate. Creating organizational capacity and coping with challenges in providing peer supports will be discussed, with recommendations for training, coaching and on-going support for peers and parents. The ParentingWell practice approach will be introduced as a model for shifting the system’s paradigm to a family focus in adult mental health services. Three blind parents discuss the how-to’s of parenting with vision loss. What are the practical alternative techniques parents who are blind use to do what would otherwise be done with sight? From infancy to young adult-hood, Melissa Riccobono, Imani Graham and Mike Bullis, explain everything from changing diapers, feeding and dressing to schools, homework and transportation. In recognition of the 28thanniversary of the Americans with Disabilities Act, this webinar focused on the rights of parents and prospective parents with disabilities. Presenters provided a brief overview of disability rights laws, and their application to families. Based on their own experiences, presenters shared advocacy strategies for ensuring accessibility throughout the community, such as in schools and health care facilities. 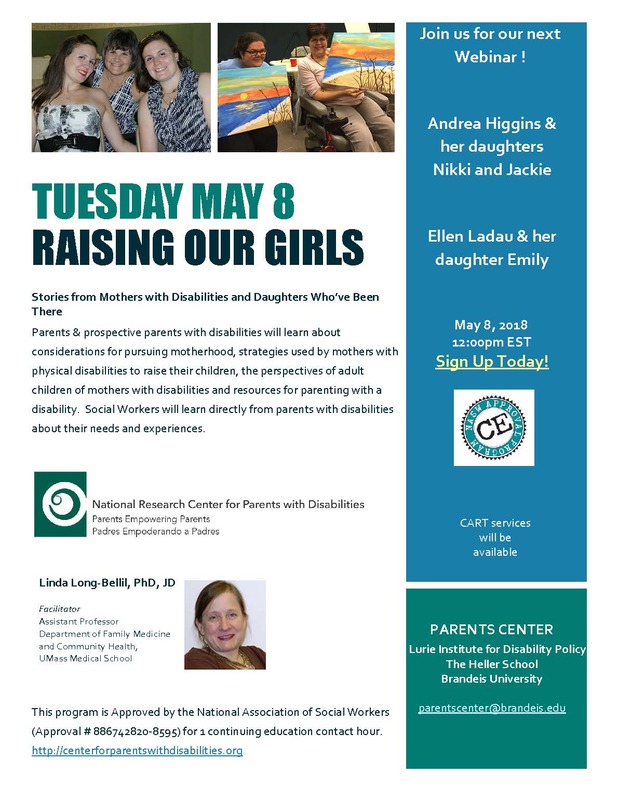 Social workers, and others who support parents with disabilities, will gain an understanding of these families and their rights by learning directly from parents with disabilities about their needs and experiences. This program was Approved by the National Association of Social Workers (Approval #: 886742820-3476) for 1.5 continuing education contact hour. Deaf parents and prospective Deaf parents learned about approaches to parenting with regard to communication/language, community engagement, and technology. Deaf parents and prospective Deaf parents also learned about how to work with their child's health care providers, how to raise a healthy and happy child, considerations regarding immunizations and safety, as well as challenges and strategies. Social workers will learn about the needs and experiences of Deaf parents from experts in the field who are members of the D/HH community. This webinar was presented in ASL. An ASL to English interpreter and CART services were available. This program was Approved by the National Association of Social Workers (Approval # 886742820-8595) for 1 continuing education contact hour. This webinar focused on strategies for prospective parents with disabilities to prepare themselves and their families for parenthood. Presenters discussed the initial considerations of conception and adoption, and explore preliminary consultation in order to identify disability affirmative service providers. Participants learned how to identify peer support among disability parenting communities to utilize for advice and support. The early identification of adaptive parenting tools and resources was emphasized. Many parents experience a mental health condition in their lifetime. Likewise, the majority of individuals living with mental illnesses are parents. Families are the focus of mental health promotion, mental illness prevention, treatment & rehabilitation. Social workers will learn about different types of interventions for parents with mental illness and their families, the advantages of leveraging access to mainstream resources, and the need to enhance existing practices to make them parent-informed and family-focused. Recognize the importance of parenting and families in promoting community inclusion, and the contribution of community inclusion to rehabilitation and recovery. This program was approved by the National Association of Social Workers (approval # 886742820-6832) for 1 continuing education contact hour. This free webinar with Robyn Powell, MA, JD provided information about how to best work with parents with intellectual disabilities and their families, including the definition of intellectual disabilities, background information on parents with disabilities, the application of disability law in the child welfare system, strategies for supporting families, and how to conduct accessible and appropriate parenting assessments. Continuing education credits were be provided by NASW. Learn about how to best work with parents with intellectual disabilities and their families, including the definition of intellectual disabilities, background information on parents with disabilities, the application of disability law in the child welfare system, strategies for supporting families, and how to conduct accessible and appropriate parenting assessments. This program was approved by the National Association of Social Workers (approval # 886742820-6926) for 1 continuing education contact hour. Learn about how to best work with parents with intellectual disabilities and their families, including the definition of intellectual disabilities, background information on parents with disabilities, the application of disability law in the child welfare system, recent case law, information about accessible and appropriate parenting assessments, and strategies for representing parents with intellectual disabilities and their families. 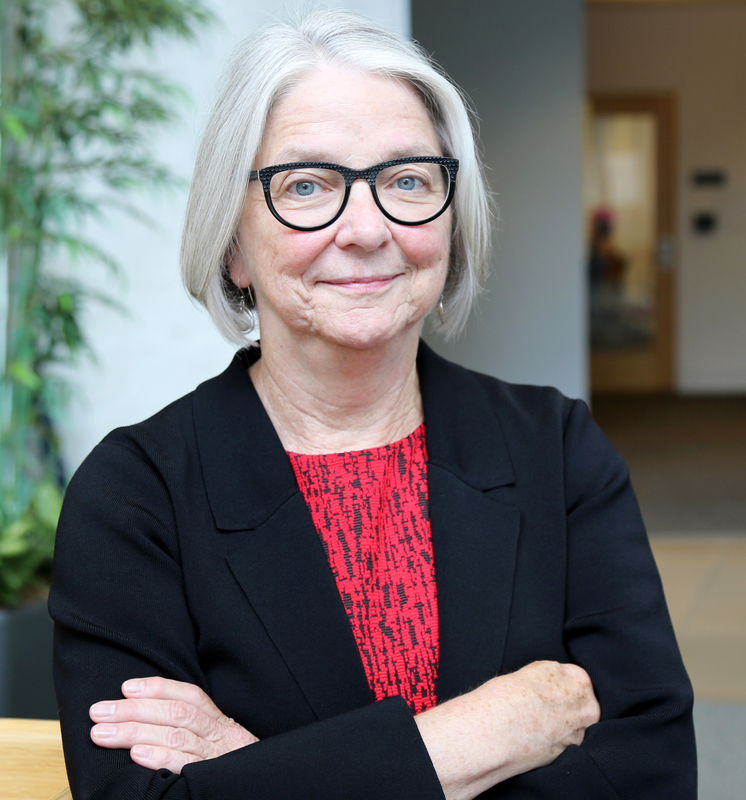 Robyn Powell was on Wisconsin Public Radio discussing the obstacles parents with disabilities face to keep their children. Listen to the interview! From WPR: Parents with disabilities are disproportionately involved in the child welfare system compared to non-disabled parents. They're also more likely to have their parental rights terminated once involved. In October, a lawsuit was filed on behalf of five parents who feel they have been discriminated against by New York's Administration for Child Services. We take a look at the issue with our guest. Robyn Powell was featured in a video by Divided States of Women in January 2018 about the pressures mothers with disabilities face in everyday life. Watch the video! There are 26 states with legislation either passed or pending that supports parents with disabilities. Check out our interactive map to learn more!